Built ready for a wide variety of indoor and outdoor applications, the diamond pattern rolled edge flat bench is adaptable, secure and sturdy. Great for locker rooms, water parks, athletic fields, transit stations, parks and more, these popular 6' and 8' backless benches are designed with portable, surface, in-ground or wall mount frames. The frames are constructed with 12-gauge, 2-3/8"O.D. round steel tubing, which provides excellent support of the expanded metal, rolled edge diamond pattern bench seat. 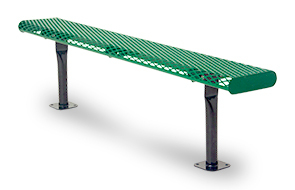 Sealed in an impact resistant, UV stabilized polyethylene finish, the extra heavy-duty, low maintenance rolled edge expanded metal bench offers maximum resiliency and years of reliable service.